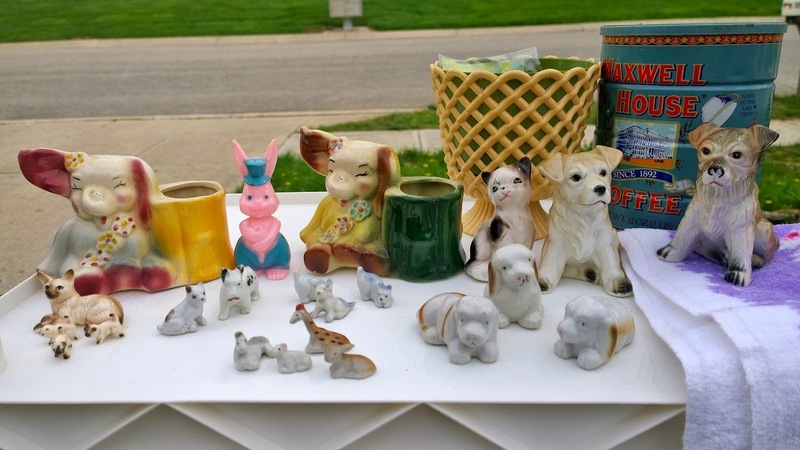 Melissa's Antiques: Garage Sales, Estate Sales, and Flea Markets - OH MY! 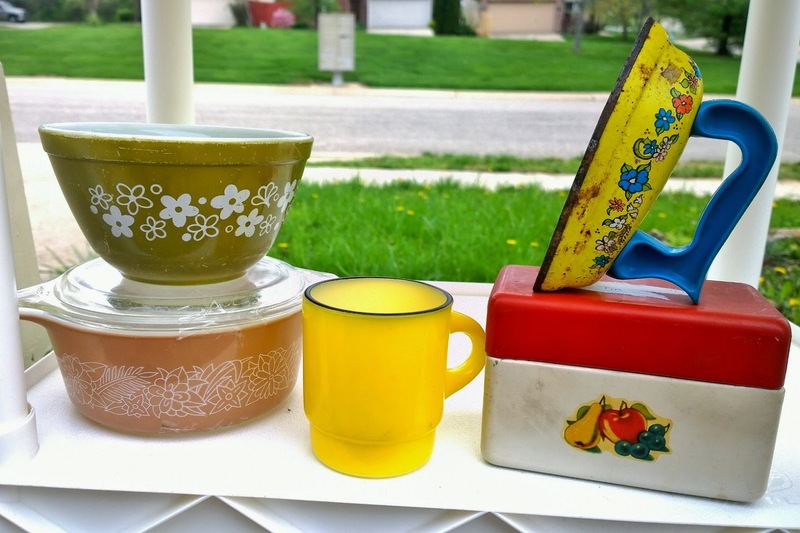 Garage Sales, Estate Sales, and Flea Markets - OH MY! Saturday I left around 7:30 in the morning to start hitting garage sales. 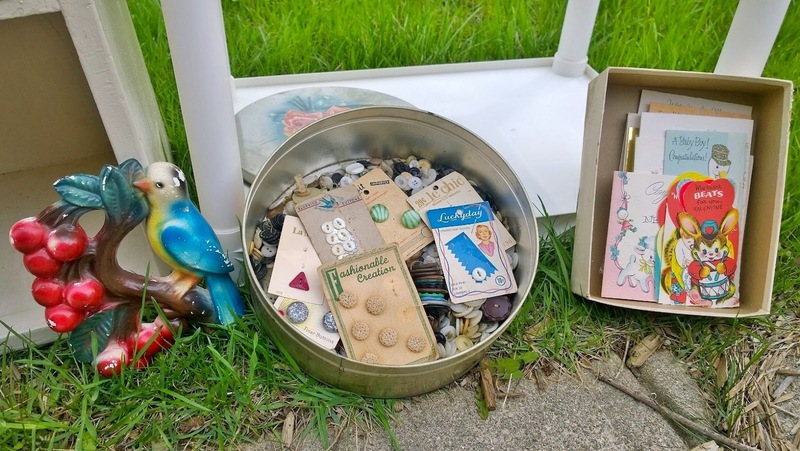 I generally only hit ones that list antique, vintage, or collectible items, since there are hundreds upon hundreds every weekend in Indianapolis and the suburbs. However, even those words, I'm finding, are being overused and taken as an excuse to overprice their junk. Unfortunately, with the first 2 garage sales I hit - that was exactly the case. I talked some sense into the first seller. 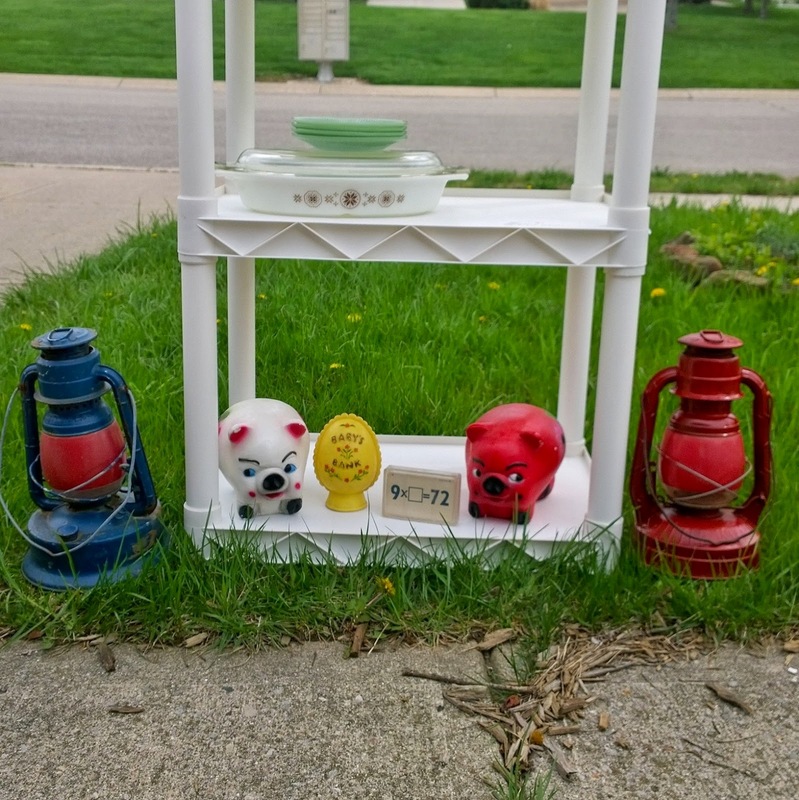 The second seller told me was an " experienced antiques dealer" and was getting rid of her booth because she didn't sell much. Hmm, I wonder why? Her prices were insane. She didn't change them for her "garage sale" either. I did manage to pick a few things that were reasonably priced. The third sale I hit was the last day of an estate sale. I picked up a few things for 25 cents each. The house was nearly empty. My guess is because the prices were great. I really wish I'd hit that sale on Friday before I headed south to spend the day with my niece and nephew. I hit a couple of flea markets next and picked up a few things. One of them I frequent at least once a month. I was really happy to see that they had gotten some nicer vendors. 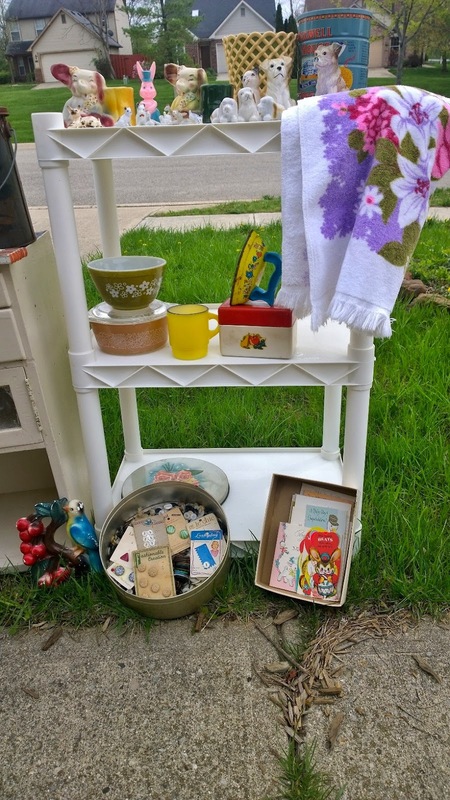 It was a lot let laundry detergent and tube socks and a lot more antiques and vintage. Plus, the prices are always reasonable. Then, I hit an estate sale that STARTED AT NOON (!!) for a man who had been a dealer for the last 20something years. His son and daughter-in-law were selling off the remainder of his stock. Everything was half price of what was on the tags. Most of the tags had been priced 10-15 years ago, so half price was a great deal for the items I was able to snag. The place was packed and I was there right at noon. Finally, I ate lunch, then went off to the last flea market of the day. Some mantiques for my booth. Can't seem to keep these little oilers in stock. My Magpie Ethel-inspired buy of the day is this pink and blue Undie Washer. Looks like Erica has picked one up too. 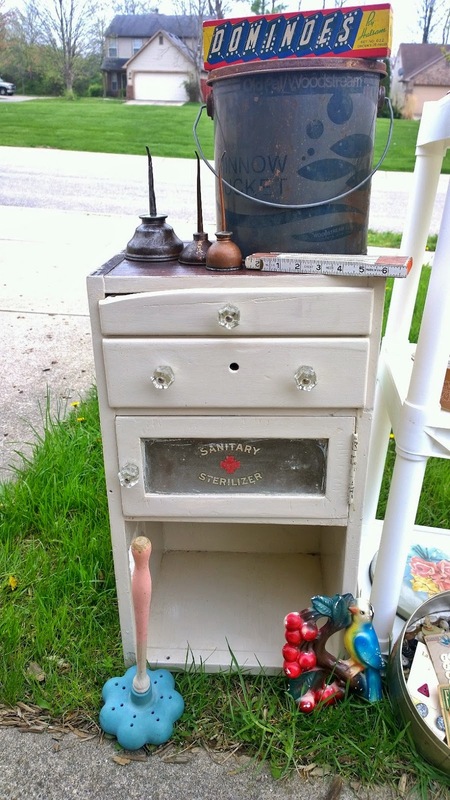 Plus you can see a close up of the sanitary cabinet I picked up from one of the last flea market I went to on Saturday. It was my favorite find of the day, I got a great deal on it, and I will definitely be keeping it! I really want to use it in my bathroom to hold towels, TP and other little nick-nacks, but both my bathrooms are tiny and it doesn't really work! 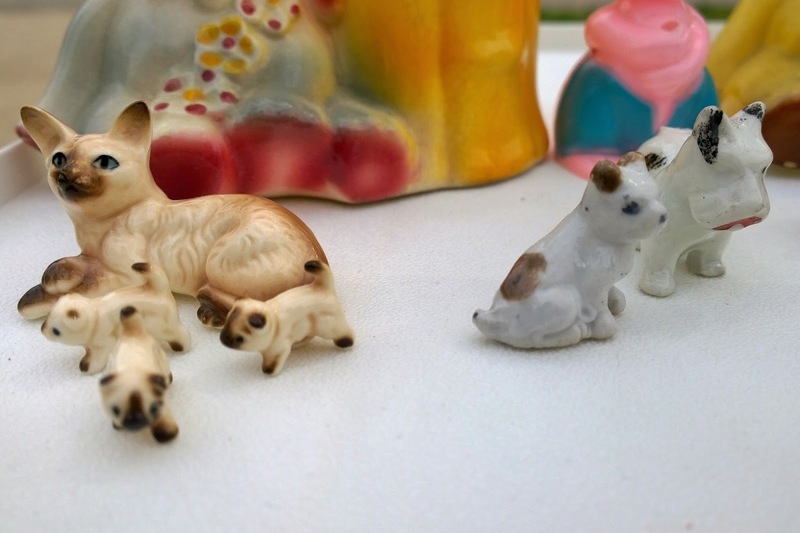 Such a cute chalkware piece. This tin full of buttons was a great deal. Lot of neat ones plus many on their cards still. I also got this box of about 50 vintage greeting cards. I can never pass up vintage greeting cards. I have SO. MANY. I got this spring blossom pyrex bowl for 50 cents! I never find them this cheap anymore. The casserole wasn't that cheap, but was still a great deal. 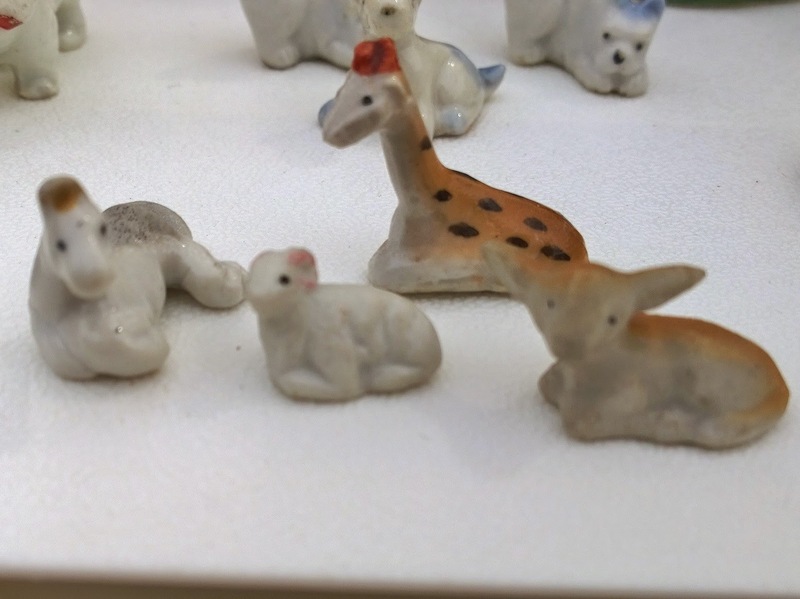 Lot of little dimestore and made in Japan ceramic pieces. Momma cat and her 3 little babies. The babies are probably each the size of a dime. 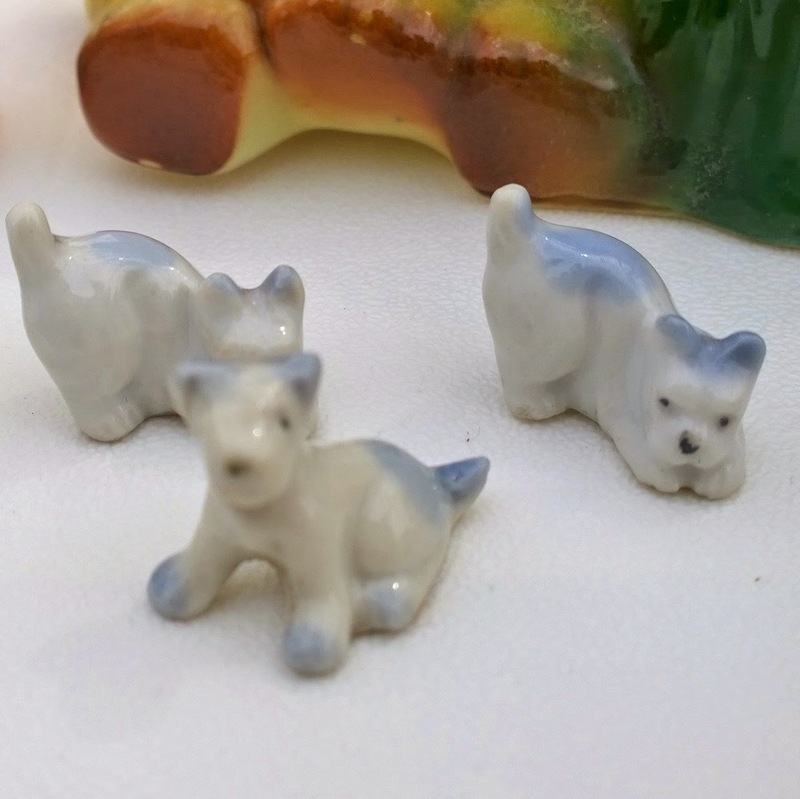 The 2 little puppies are marked Japan. These 3 little guys are about the size of a quarter. These 4 are super tiny, too - about the size of a dime! This wraps up MY finds from Saturday, but wait until you see what mom bought me. Pardon the pictures, because they're ones mom took with her cell phone to show me what she bought. I'm proud that she can even send picture messages. She used to call me to try and describe the things to me to see if I wanted them. It was interesting when she was describing Pyrex Patterns... ie: she would say "the ugly mushroom one" or I remember once she said "it has a bunch of blue dots and its only 25 cents." Love when I get a text file on mom on a Saturday morning with the caption: I got these for 50 cents each. Seriously, mom gets THE BEST stuff. Oh yeah, these are full with their original Barbies, Kens, accessories, etc. Peek inside the cases that mom bought. Yep, that's right, Pyrex bowls for 50 cents each (even though they're not a popular patter). AND 4 1960s Barbie dolls with accessories in their cases... AND they were a great deal. I have a few from an auction I attended the first day of November last year. Mom did good, yet again. These finds aren't nearly as exciting, but they're from a flea market that I stopped at on my way to visit my niece and nephew on Friday. 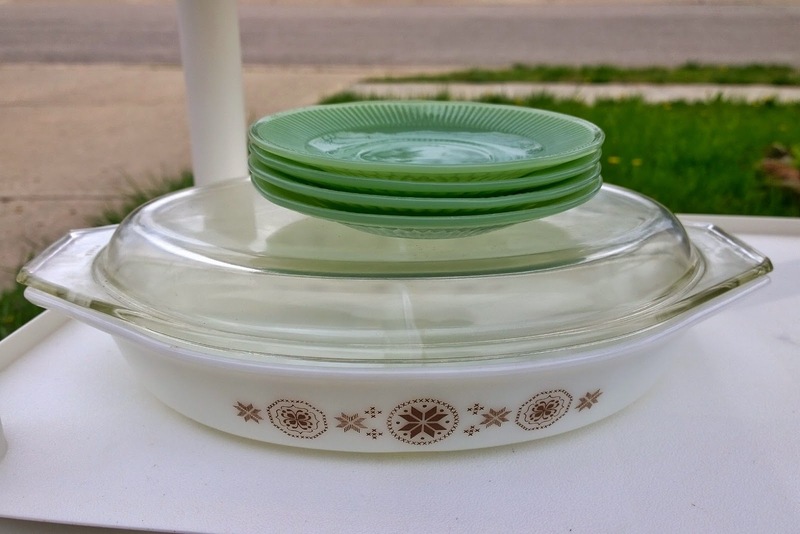 Jadeite and Pyrex at a great price! 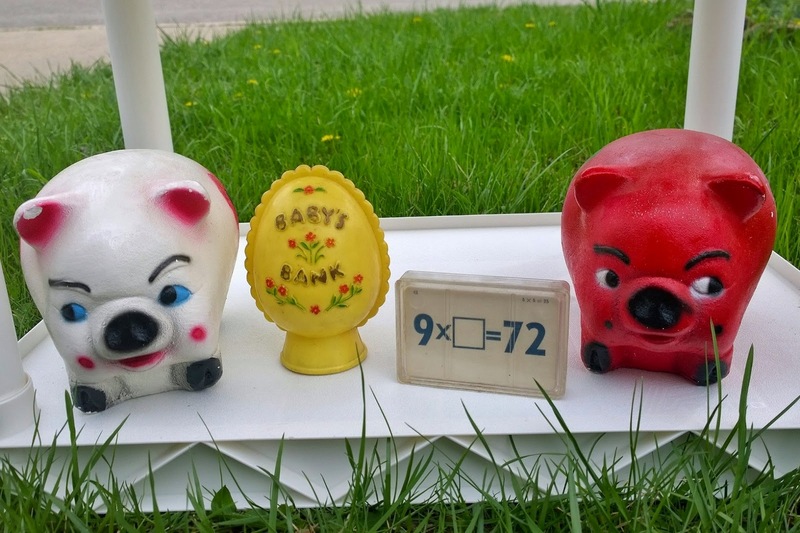 2 chalkware piggie banks - aren't they cute?! A plastic Baby Bank. AND - these vintage flash cards. They're a story all by themselves. 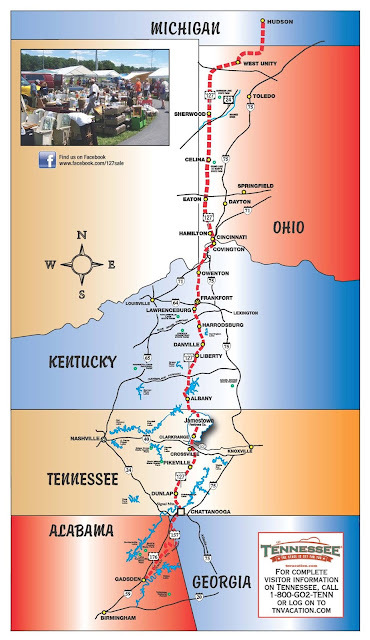 There was a "HUGE BARN SALE" advertised about 15 minutes from my niece and nephew live. The ad sounded like a huge stock of vintage and antique goodness. I had to go, right? Well, I drove 5 miles down a narrow, half washed out gravel road to come to this barn. There was one other person there, besides the owner, so I didn't feel too weird about getting out to look. I walked through this barn of junk, only to find these flash cards. It turns out that the owner buys out what's left of estates after estate sale companies sell everything they can. So, what's left? 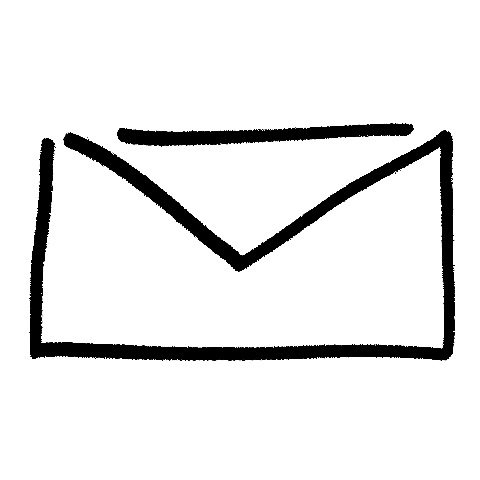 The junk that no one wants. 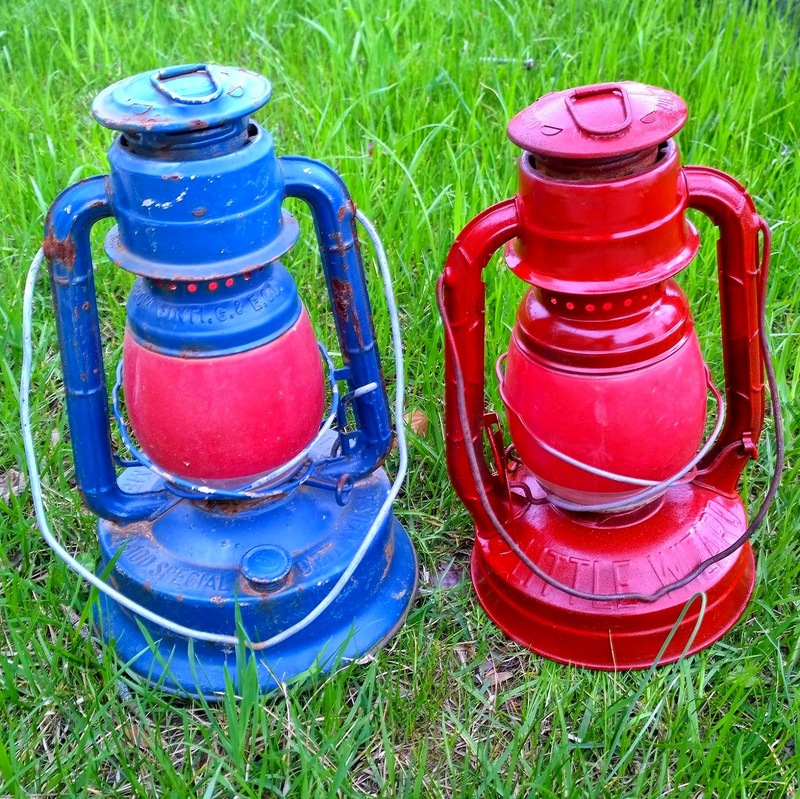 I also got these 2 Dietz lanterns for a great price. They'll be heading to the booth. Another mantique item that I can't seem to keep in stock. I have bought a super rusty one with no globe and it still sold pretty fast. Well, that's it for this weekend. Not too bad. Still hoping for another mega suitcase haul. Nice scores this weekend!!! I adore vintage greeting cards :) Fun to see your treasures. 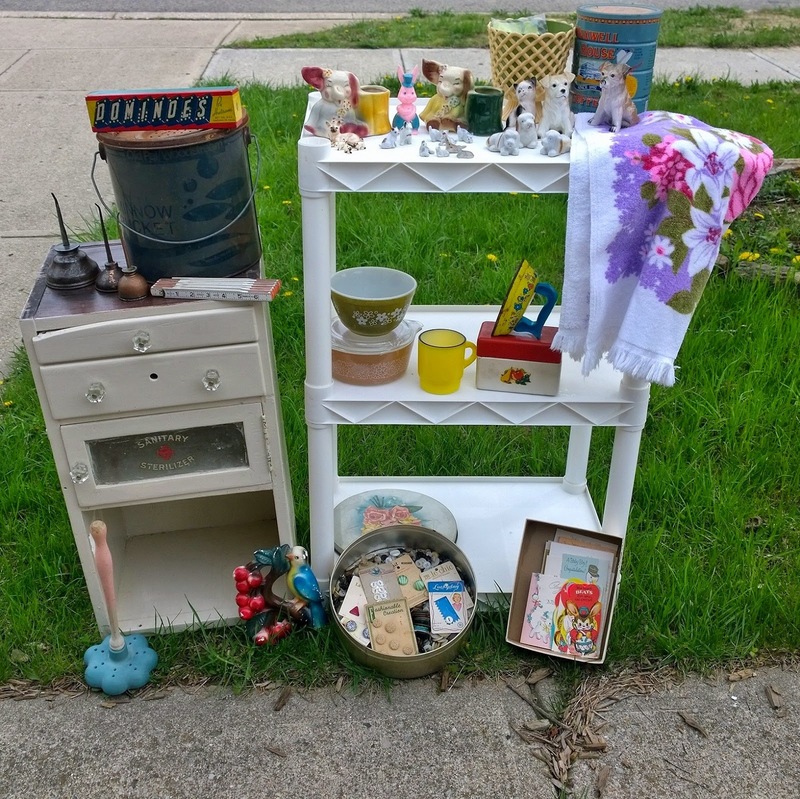 We had a wild weekend at he antique mall - stuff was strewn all over. Love your treasures - especially the Barbie and friends loot! I wish I could go shopping with your mother. Looks like you got some great stuff, I see lots of things I wouldn't pass up! 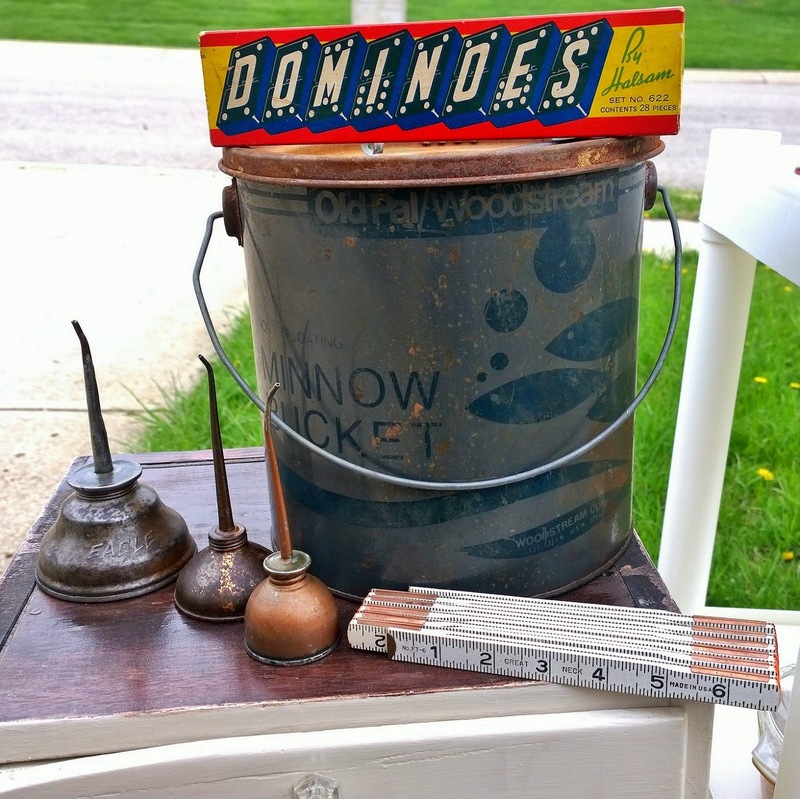 Wow, what a great junking day you had! Love all your finds especially the sanitizer cabinet. Your mom really knows how to pick some great stuff. The Barbie cases bring back a lot of memories. Thanks for sharing at Vintage Inspiration Party. You found so many treasures!! 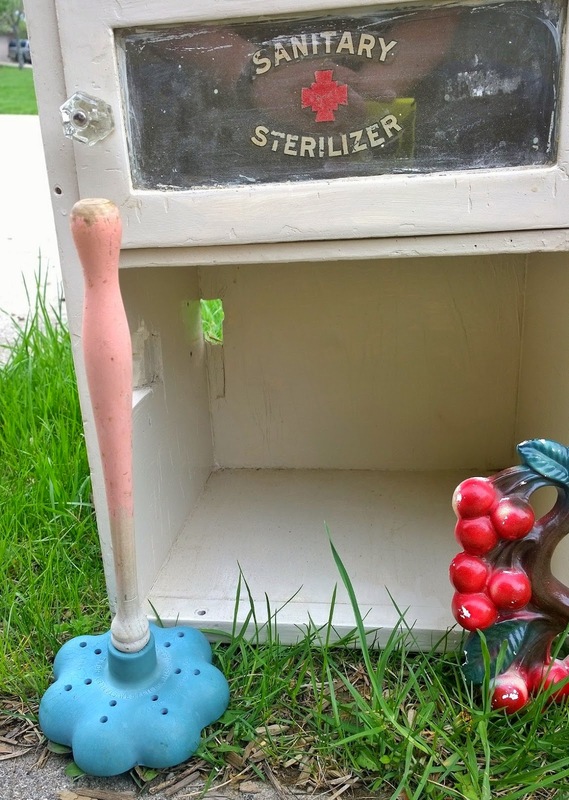 Loving them and especially the Sanitary Sterilizer! I want one!! Wow Melissa, you really found some great stuff! Love the sanitary cabinet!! I recently bought a medical cart at an estate sale. It sure would be cute on it. lol! It wasn't a fabulous buy, but I fell in love with it. I found that exact same dominos game on our way to Zion at a storage sell we saw and stopped at. The laundry plunger is so fun and Magpie Ethyl does find such great finds! Thanks for sharing with SYC. I love that sterilizer white chest. I would be keeping that too :) great finds!